The VSAT 2019 is one of the exams conducted by the Vignan University. The university has been proving its standards to thrive in the competitive world. The university is located in Guntur, Andhra Pradesh accepting admissions of students from across the country. Latest Update: VSAT 2019 Application Submission Starts from 10 Sept 2018. The Last Date is 05 April 2019. Latest Update: VSAT 2019 Schedule Announced!! Check Dates below in the table. VSAT stands for the Vignan Scholastic Aptitude Test taken for aspirants of engineering and pharmacy courses. The exam is compulsion gateway of getting Vignan University Admissions 2019 for all those students who haven’t appeared in prominent national exam like JEE Mains/ JEE Advance/ EAMCET. Those who are interested to take admission in the exam can readout detailed information of the exam such as application dates, process, exam dates, pattern, admit card and all other exams related information. 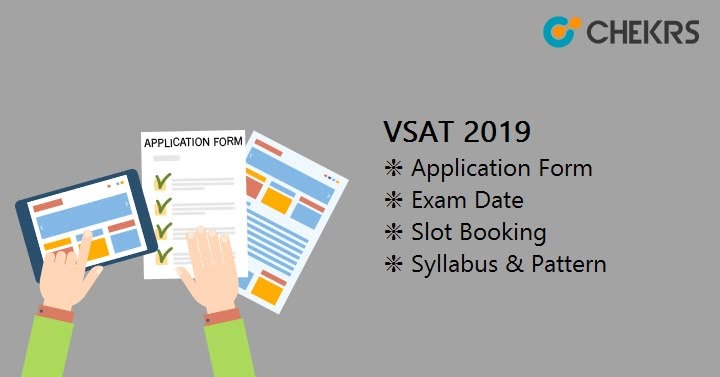 It is not just the VSAT Exam Date 2019 which is major for any student to keep eye on. Thus here through the detailed table, it will be easy for all to know what should be missed. Slot and Timing Slot 1. 08.00 A.M. to 10.30 A.M.
Slot 2. 11.00 A.M. to 01.30 P.M.
Slot 3. 02.30 P.M. to 05.00 P.M. The VSAT only permits entry of students in streams of B.Tech or B. Pharmacy. Each university has their own set of criteria for granting admission to students. However, from an aspirant point of view, it is crucial to learn the VSAT Eligibility Criteria. Interested candidates in order to proceed to fill the application can read out Vignan University Admission Eligibility. Age limit: The maximum age of a candidate should be 21 years. Education Qualification: The candidate should have qualified Physics, Chemistry, Mathematics, and English with a minimum aggregate of 60% are eligible. Other admission criteria: Besides VSAT, other considerable exam performances by the university are marks scored in JEE Exam or EAMCET. Also, along with scorecards, it is crucial for one to fulfill the essential educational qualification. In order to proceed and pursue much-awaited admission process, filling application form is foremost and important. The VSAT Applications can be submitted in any of the ways i.e. online and offline. Those who are looking an easy guide for the whole process can take the assistance of VSAT Application Download link provided by us. The link is useful for those who are not comfortable with the online submission procedure. Fill all details in the correct form and choose the slot timings wisely for the opting course. Open website of Vignan University. From the home page click on the available link of admission. The registration page will open up; register yourself using valid ID details. Post registration; access the VSAT Application Form by logging into the website. Submit all relevant details as asked and instructed. Click on submit and proceed to payment. Pay the fee using any of the convenient options to you. After successful submission of your application, your application has been accepted. Those who want to assure that they are selected for the program they are aspiring and interested in the need to surely have knowledge of the VSAT Paper Pattern. The essential details of Vignan Entrance Exam Pattern are given here through which one can learn what format should be followed while indulging in practice sessions. Marking Scheme: One mark credit for each correct answer and no negative marking. The Biology subject will be attempted by students who are seeking admission in B.Pharma or B Btech Biotechnology courses. The syllabus is another important aspect for those who want sure selection. The VSAT Exam Syllabus is likely to change every time as per the requirements and set the standard for the exam. Aspirants of the exam need to stick to Vignan Entrance Exam 2019 Syllabus as though it does and don’t are clearly known. Being your online education partner, here we will be facilitating the syllabus pdf in the separate detailed article. Aspirants can know the availability by taking the subscription. Slot booking is a mandatory process for all those students who have successfully admitted their application forms. However, the process is for online applicants only. Slot 2 11.00 A.M. to 01.30 P.M.
Slot 3 02.30 P.M. to 05.00 P.M.
Those who have submitted the offline application cannot participate and change their slots. The examination will be an online one hence the dates scheduled for the exam is different for many test cities and their centers. Also, the exam is taken in 3 slots for each date. To learn allotted time, date and venue of the exam, hall tickets are important for all to posses at the time of their online exam. The VSAT Hall Ticket Download link will be provided to students who would have submitted online applications. The university will also provide VSAT Admit Card by post to candidates whose applications were accepted by them in offline mode. The result of the exam is updated to candidates within 20days after the exam date. The VSAT Exam Result consists of the total score each candidate has scored based on his performance. However, the selection is giving to candidates based on the best ranks places in merit list. The merit list is framed in ascending order of highest scores. The university hails qualifiers of the exam to confirm their admission in the university in the counselling process. One can know the dates through updates of counseling dates provided by us. At the time of VSAT Counselling one has to bring original documents of the mandatorily asked documents as listed above. After the successful document verification candidates will get the admission.